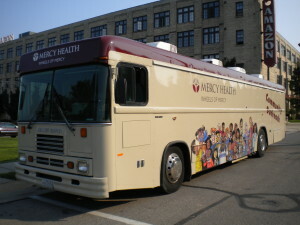 Wheels of Mercy is a mobile unit that brings health care into the community. Watch for the Wheels of Mercy at events, local health fairs and summer activities. All screenings provided by Wheels of Mercy are free of charge and our Community Health Workers are available to talk to you about your health needs and concerns. Screening availability may vary depending on the event and location, but options often include: enrollment assistance, blood pressure, A1c (diabetes), Chronic Kidney Disease, Pulmonary Function, HIV/AIDS, and STDs.